Yandex.Metrica is a web analytics tool that you can use to collect data about visitors to your site and their sessions. To do this, you must create and install a tag (code that you insert onto your webpages). You can use the tag data to set up your strategies and ad audiences for Yandex.Direct campaigns. 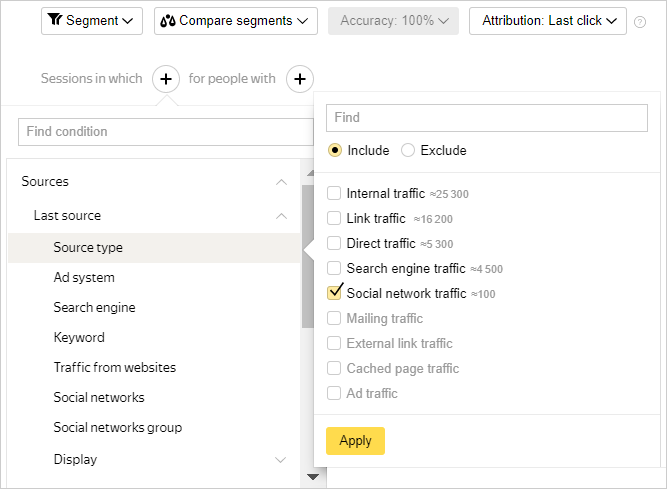 You can use Yandex.Metrica goals (for user behavior) and segments (for users with certain characteristics) in Yandex.Direct. To create a goal, go to the Yandex.Metrica tag settings, find the Goals tab, and click Add goal. 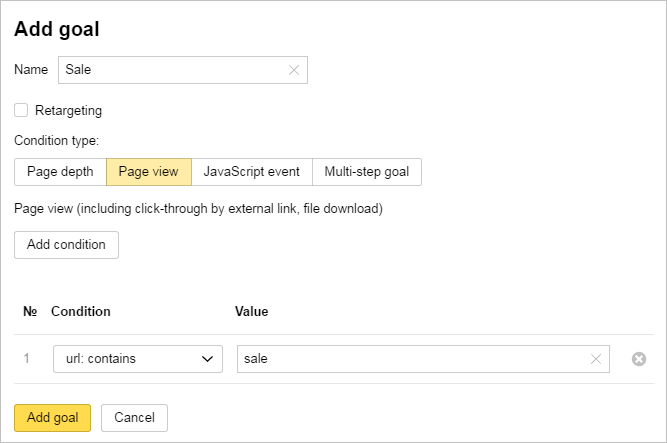 You can't use multi-step goals in Yandex.Direct. You can read more about goals in the Yandex.Metrica Help. To create a Yandex.Metrica segment, go to any report and set selection criteria for sessions and people. For example, you can select visitors who arrived at your site from social networks. Then click Segment → Save as and enter a name. Read more about segments in the Yandex.Metrica Help. You can use Yandex.Metrica data that you collect from webpages to set up retargeting and automatic strategies. You can display ads to people who have already interacted with your site. For example, you can tell people who already ordered items on your site that they get a discount on their next purchase. Or you can suggest that users who viewed your site on mobile devices download your app. You can use Yandex.Metrica goals and segments for this. Just click Retargeting & Audiences → Add on the page where you edit ads. More about retargeting lists. The most important clicks for advertisers are those that result in users performing a useful action. For example, adding an item to their basket or placing an order. In Yandex.Metrica, you can set goals that correspond to useful actions and calculate your campaign budget based on them. For this purpose, automatic strategies were created in Yandex.Direct: “Average cost per action”, “Average return on investment” and “Optimize the number of conversions” (for smart banners). You just need to enter a goal and corresponding indicator value (such as the cost per action) in your strategy settings. Then the system will select bids and keywords to bring your average indicator value for the week closer to the one you set and get you as many conversions as possible. Note. If the settings don't appear after you select your strategy, there may not be any goals linked to your Yandex.Metrica tag that have compiled enough statistics. Requirements for goals are indicated in the Help sections for the corresponding strategies.